Leadership training helps young people master the skills they need to succeed in life. If you work on developing these skills while playing games with your student team, the lessons remain fresh and memorable for your teens. This leadership game can be played with two to twenty teens. The goal is to meet four community members who complete a row on your bingo card. This helps youth get to know leaders who are already in the community. You will need to talk to important community leaders to gather information about their open business or office hours and willingness to participate. The game works best if you use a variety of businesses and politicians within a 15-minute walk of your meeting place. If necessary, give your teens a list of acceptable locations to visit, and note those that are off-limits. Create bingo cards using a grid of four spaces across and four down. In each space, write a brief description of a job within your community. For example, one space might say, "drives an emergency vehicle," and another could say, "sells food." Ask each player to bring a camera. Give each participant, or team, a bingo card. Go over all the rules, including boundaries and expected behavior. Each player is to go into the community and find a person who fits the descriptions listed on his bingo card. They must collect a business card or take a photo with that individual as proof. Once a player has met four community members who complete a row on the bingo card, the player should return to the designated meeting spot. Every participant who gets a 'bingo' wins. Once everyone returns, open a discussion about the different community members each player met and why that person is important to the community. Community Bingo teaches youth basic reasoning skills, networking skills, and helps them learn confidence in meeting new people. You can modify this game by having players work in teams or by creating a mock community within your classroom. In the mock community, some group members would play the part of different community members while the rest of the group completes the bingo card. 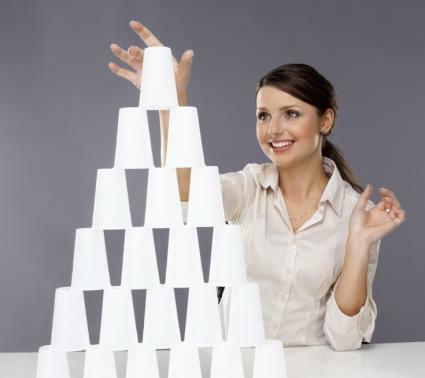 The goal of this group game is to complete a cup pyramid of steps that will help you achieve a specific goal. It can be played with anywhere from five to thirty players. You will need to provide six plastic cups per player. All the cups should be stacked at one end of an empty room such as a gymnasium. You will also need to provide a marker for each participant. When you say "go," each player must run to the other end of the room and grab one cup and one marker. Each player must then go sit somewhere in the middle of the floor and write a specific goal on the cup. Each player will leave their goal cup in the spot they have chosen on the floor and run back to the cup area to take another cup. Upon returning to their 'area' each player will write one step that will help them achieve the chosen goal. Players continue in this fashion until they have five steps and one goal written on separate cups. Players must then stack their cups into a pyramid with the goal on top and wait for the rest of the group to finish. All players who create their pyramid and keep it from falling over, win. The Goal Pyramid game sounds easy, but once you have a large group of teens running back and forth across the room it gets much more complicated. People may lose their markers, have trouble coming up with enough steps, or accidentally knock over other people's pyramids as they run by. This game helps youth develop problem-solving and goal-setting skills. Every person is motivated to work for different reasons. Some people are more motivated by money while others will work harder if it provides some benefit to loved ones. The leader in this activity must discover what motivates each team member to get off the couch and work to complete an undesirable task. You can set a real or fictional task such as picking up garbage in a large park on a hot afternoon or cleaning public restrooms. The game works best with four to six players. You will need a couch, bench, or other designated area where all but one teen from the group can sit. You should also have a table filled with common things that motivate people to work hard. Examples of motivators include food, money, video games, clothes, or pictures of loved ones. One player should be selected as the leader while the others sit together on the couch. Each player on the couch should mentally choose one of the supplied motivators that would convince him to complete the task. Set a timer for 30 seconds. The leader will choose one 'motivator' at a time and try to persuade each member of the team to stand up and help complete the task. The leader may only select one 'motivator' per person sitting on the couch. Leaders can choose any strategy they believe will work, but should be instructed to take individual personalities into account. If the leader succeeds in getting the whole team off the couch within the set time limit everyone wins. If not, a new leader should be chosen and the game begins again. When the game is over, open a discussion about why each motivator is appealing. This simple game will help youth learn what kinds of things motivate different kinds of people. In learning to guide others as a leader it is important to know how to get your group actively interested in completing any task. It is possible for the whole group to choose the same motivator or for each person to select a different one. In this small group game, three to five players will try to create a designated snack without any verbal communication. Each player takes on a leadership role as they try to leave clues for the next team member about what the designated snack is thought to be. You will need to provide a variety of food items that can be used to create specific snacks. Assemble all the food onto a table designated as the pantry. Select the person who will go first and choose an order for the rest of the team. Students should be directed to think about a strategy for communicating their intentions nonverbally. In secret tell the starting player what snack you want them to create. For example, you could ask them to make a peanut butter and banana sandwich, ants on a log, or trail mix. You will also need a timer. When tell them to start, the first person must start to work on making the designated snack. After 30 seconds (or one minute for fewer players) the first person must exit the cooking area without speaking and the second person takes over. The second person must try to figure out what the snack is and continue working on it. Play continues until everyone has had a turn. The last person is responsible for plating a finished snack. The team wins if they created the correct snack. If the team loses, discuss possible strategies and start over with a new snack and team order. Open a discussion about what strategies or techniques worked, what did not, and why. The high-pressure nature of this game and inability to communicate will teach deduction skills and organizational skills on the fly. If the first player uses the strategy of separating out the required ingredients, it will give the other players a better idea of what snack to create. The ability to process information and make quick decisions will help leaders and teams meet deadlines. This small group game challenges five to seven players to match three favorite things to each participant within a given time limit. The group will have to formulate a plan for execution and trust in each member to play a part in the solution. You will need a photo of each group member taped to a wall. As a group, decide on three subjects of favorites to focus on such as favorite food, favorite movie, and favorite color. Each player must then discreetly write down her favorite from each category on a separate slip of paper. Gather all the slips of paper and shake them up in a large bowl. You will also need a timer. The group will have 30 seconds to formulate and agree upon a plan for executing the task. The game play timer will then be set for two minutes. During the two minutes of game play, there will be no talking allowed. 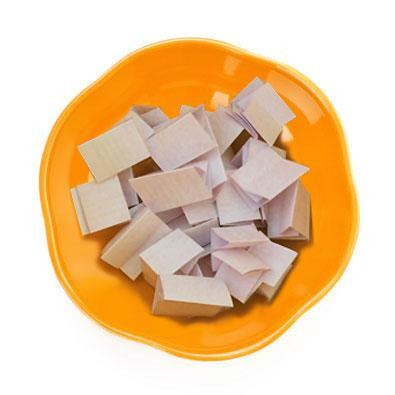 As a group, the team should pick slips of paper from the bowl. The group can decide to pull one at a time or several at a time. The team must then attribute each favorite to a person by taping the slips of paper under each player's photo. Game play continues like this until all the slips of paper have been designated to a person or time runs out. The group director can then tell the group if they are correct or incorrect. If any answers are incorrect, the director should only state how many are incorrect. If the group is correct, they win. If not, they must try to make changes until they are correct. Open a discussion about creating effective plans and working as a team to achieve a goal. Group members will have to make a quick plan before they are unable to communicate verbally. Each player must be trusted to follow the plan during game play. Some players will step up and quickly share a plan with the group while others will agree to follow any strategy suggested. Group members must learn to communicate both verbally and nonverbally while working as a team. The plan that works best for this game would be to spread out all the slips of paper and have each player find his favorites and tape them by his picture. In this case, the group is relying on each member to select his answers truthfully and complete his part of the task. Effective teamwork involves a shared goal, a clear plan, and each person pulling her weight. The fun and excitement of games can help teens loosen up and get creative. Youth leadership games can teach a wide variety of skills while promoting a team atmosphere.